There are more reasons to hire tax professional for tax preparation and other tax return requirements such as filing. Apart from saving time and energy, they help out in a number of ways as follows. Decisive for tax payers: Tax professionals help you in analyzing the form or category to do E-filing based on your financial background. Stay updated: Genuine Tax Professionals have a fair understanding of tax law and credits and they are always updated to the changes taking place in tax sectors. Hence they save your minutes and funds on your behalf by IRS electronic filing. Presenting liveliness: A tax professional does a great job by saving your time and energy of by making your tax returns and filing it on time. Simplicity: They carefully evaluate your tax returns based on your investments, divisions, business ownership, property acquisitions and other such factors. 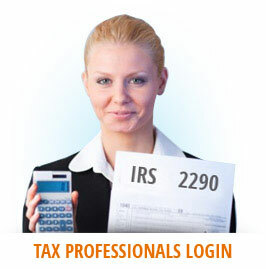 Thus a tax expert is highly vital for making your e-filing, a smiling process. They help in filing heavy highway vehicle use tax return and more other tax returning procedures. Specialty of our tax professionals: They possess overall proficiency level that perfectly fits to the requirement. This leads your right choice to end up as right outcome. While choosing the tax professional, keep in mind that they should have expertise level up to the mark. They will also help in assisting you with e-filing and to select the right choice. Before deciding check with your family and friends for referrals. Depending on the pros and cons you can make further move. Look out for tax professionals experience on seeing the years of service and track their records. Ensure whether the tax professional is a member of renowned organizations like National Association of tax professionals (NATP). Confirm whether tax professional you choose stay updated on the federal laws and current scenario of tax systems. Tax professional should customize his services based on client’s requirement and profile. He should maintain the privacy and confidential information of the client. Above all, the tax professional should follow the NATP’s norms. There are familiar financial positions for a tax professional. They are as follows. Certified public accountant (CPA): A tax professional with a college degree and certification is called Certified public accountant. A CPA is eligible to represent tax payers in an Internal Revenue Service (IRS) audit. Financial planner (FP) / certified financial planner (CFP): FP is a tax professional who specializes in evaluating individual needs, investments and planning to help individuals with their financial goals. A CFP should have passed a comprehensive test. Enrolled agent (EA): Tax professional who are qualified to represent taxpayer for an audit before the Internal (IRS) are termed as EA. EA should have passed an extensive tax exam by the Internal Revenue Service (IRS) and should continue his learning in taxation to keep updated. Tax attorney: Apart from extensive education for obtaining law degree, tax attorneys should satisfy additional educational requirements. They specialize in legal issues and litigation surrounding taxes. Unlicensed tax preparers: Tax Professional who is trustworthy, knowledgeable, and has prepared tax returns for years but is not licensed is called unlicensed tax preparers.